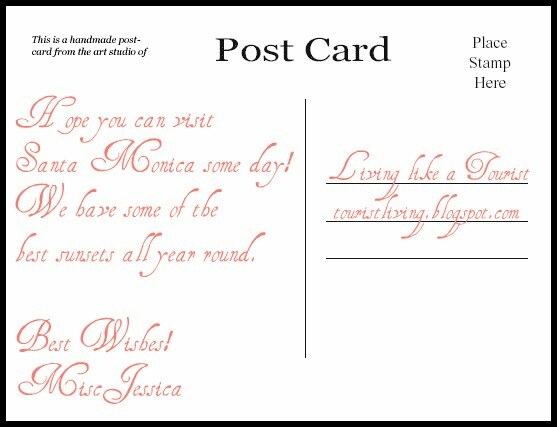 Living like a tourist: Postcard from Jessica in Santa Monica! 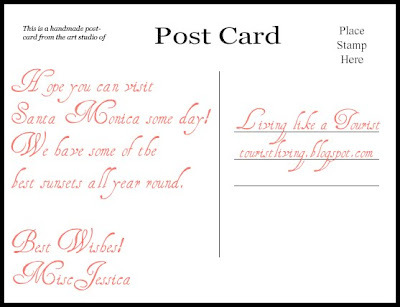 As Jessica writes, you can see gorgeous sunsets at any time of the year. With an average of 310 days of sunshine a year, Santa Monica has beautiful days as well as dusks. 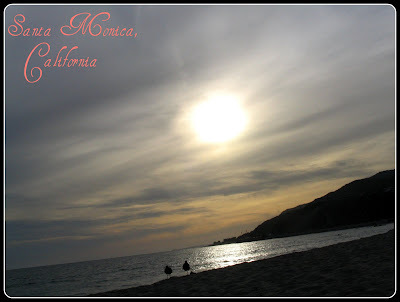 Santa Monica is located in western Los Angeles county in the southern part of California. It has a Mediterranean type climate with low temperatures hovering around 63 degrees F (17C) in January and high temperatures usually no more than the mid-80s (around 30C) in the summer. So it is not surprising that Santa Monica is known for its beaches. Along those lines, it is interesting to note that Santa Monica is home to the Original "Muscle Beach." Since the 1930s, the beach just south of Santa Monica Pier has offered workout areas that became popular in the bodybuilding world. Many famous bodybuilders, and actors alike, trained on the workout equipment found at this beach. The workout craze that hit the nation was said to have started here, attributing Muscle Beach as the "Birthplace of the Physical Fitness Boom of the Twentieth Century." Although this area still offers workout and gymnastic equipment, the weightlifting and bodybuilding competitions moved to Venice, California (i.e. Muscle Beach Venice). Santa Monica is also famous for its Pier, the site of an arcade, an aquarium, street performers and a multitude of rides like the Carousel and a nine-story Ferris Wheel, which incidentally is solar-powered (the only one in the world). So if you always pictured California as a place for sun and fun, it sounds like Santa Monica with its 310 days of sunshine and its amusement park pier is what you are looking for!